This common species is distinguished by three conspicuous white lines that run longitudinally on the dorsal surface of its body. The center line branches at the animal’s head and extends down each oral tentacle. Clusters of cerata (external projections used for respiration and often digestion) are light orange to red, and more or less evenly spaced on the animal’s dorsal surface. The three-lined aeolid is relatively slender, and can reach 3.6 cm in length. Its chemosensing rhinophores have visible rings. This species can be found on rocks and hydroids in the low intertidal to depths of 50 m. Its range extends from southern Alaska to northern Mexico. This species is often found in close proximity to red-gilled nudibranchs (F. verrucosa) — a species that looks quite similar. However, the cerata of the red-gilled nudibranch are less clustered, and the species lacks the three longitudinal dorsal lines. Also, the rhinophores and oral tentacles of the three-lined nudibranch usually have orange tips. 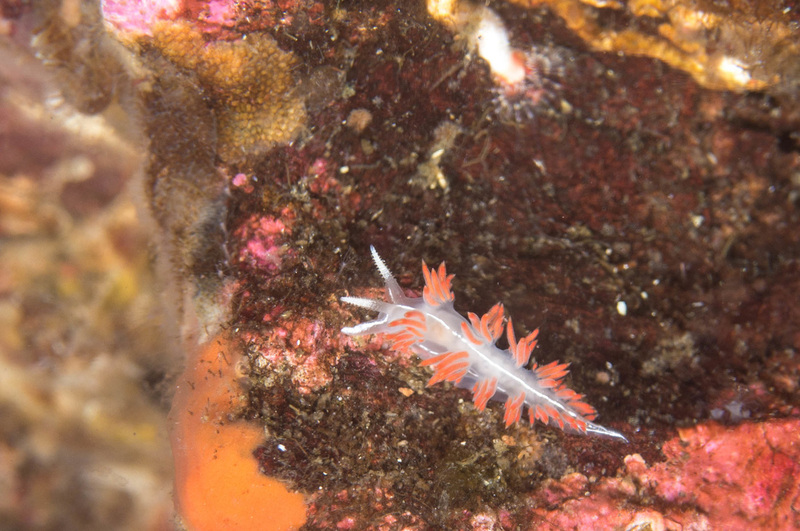 The red-lined nudibranch feeds on the polyps of pink-mouthed hydroids (Tubularia spp.). Flabellina trilineata (O'Donoghue, 1921). In Sea Slug Forum. Australian Museum, Sydney. Accessed 2016-03-02. Harbo, R. M. (1999). Whelks to whales: Coastal marine life of the Pacific Northwest. Madeira Park, BC: Harbour Publishing. P. 120.